Pioneers in the industry, we offer industrial water chiller, water cooled chillers, water chilling machine and laser water chiller from India. Our organization has gained recognition as a flourishing organization for providing Water Chillers that are used in pharmaceutical, chemical & commercial purpose. 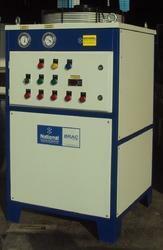 Offered chillers are manufactured using premium quality components and advanced technology in line with industry norms. 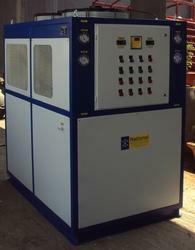 The provided chillers can be availed in variegated specifications and sizes as per the needs of our clients. 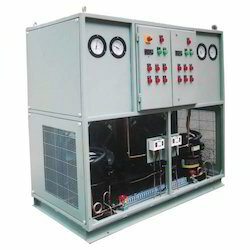 Furthermore, we offer these chillers to our clients at pocket friendly prices. With the support of our adroit professionals, we provide our clients a high quality Water Chillers that provides a steady thermal environment for chilling process. Our offered chillers are made using superior quality components and modern technology in compliance with industry norms. Due to their various quality measures, these chillers are widely praised by the clients. Our quality experts test these chillers on varied quality measures. Our firm is among the trusted names, engaged in providing Water Cooled Chillers. With the aid of latest machinery and advanced technology, we have been able to offer high quality Water Chillers to our valuable customers. 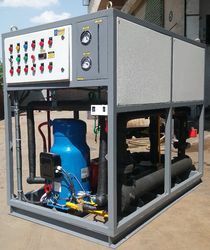 Looking for Water Chillers ?